15.04.1989 - BODIE 3.7 . you'll never walk alone ! 29 years but never forgotten. I feel with all of them. 29 years ago and i can still see everything as though it was yesterday. They will never be forgotten. What a terrible thing - I'm so glad that justice was finally done - but it should never have taken so long - and it should never have happened at all. I'm glad you posted this, it reminds us all that we should always remember. 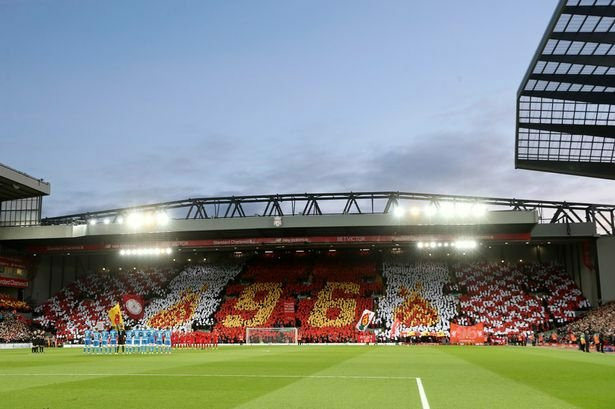 This was liverpool remembering at anfield yesterday and they will never be forgotten. I will remember them personally at 3.06 pm when the game was abandoned. It's a beautiful way of remembering them. A nice way to remember. A long time ago but never will be forgotten. yes it is and even though it was 29 years ago today those 96 fans who lost their lives will never be forgotten. That's a great tribute! Thinking of you, today! It's a beautiful tribute isn't it and thankyou so much for your thoughts, they are very much appreciated. 29 years? I can't believe it's that long ago. A terrible time. yes 29 years which have gone by in a flash but every year is a time to reflect and remember. no not at all and thankyou for looking and leaving a comment. I don't know if you are a fan of Manic Street Preachers, but they released a new album on Friday and one of the songs references the 96, Liverpool and all that history (not the first time they have done so, either). It's a very stirring song. Here are the lyrics. There's defiance in these bones. thankyou so much for sharing this, i do listen to the manic street preachers and i was aware of the new album but haven't heard it yet. This sounds like a wonderful tune.